Puck Connolly is a girl who is living in a house that will soon be taken by the government with her brothers, Gabe and Finn. They live by the sea, where every year in November, the government hosts a race known as the Scorpio Races. Gabe decides to move away this year, and Puck wants to do everything to stop him, including race in the Scorpio Races, a race made for men. The only way to delay Gabe from going is to join, so she does, ignoring all the commotion and the insults that go along with her decision. She trains her island pony to run in a race made for water horses, and while she and her brother and Finn are struggling to pull everything together, Gabe is away for days on end, avoiding Puck and Finn. She is awed and slowly befriends Sean Kendrick, a four-time winner of the Scorpio Races. To officially enter the race, Puck goes to the Scorpio Festival to finalize her registration. 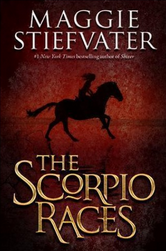 However, before she is able to complete her registration, Ian Privett, another competitor, tries to reason with her, telling her that no woman has ever joined the Scorpio Races. Meanwhile, Mutt Malvern tries to take away Sean’s reputation by taking another horse that seems faster than Sean’s own horse. Both Puck and Sean want to win, but they both know that there can only be one winner. I never thought that I would like the book when a friend recommended it to me. I read the first few pages, and decided to read the rest of it. This book is interesting in a way that it makes sense, especially with the water horse eating people on November. There were good word choices, and nothing too complicated. There weaknesses in this particular book was that it was somewhat predictable, and that the ending ended strangely. I would recommend this book to older middle school students and young high school students because of the contents in the book. The meaning of what the author is trying to convey in the book is hard to understand unless someone is looking hard to find the moral. This is a really good book overall, and as the book goes on, there are unexpected plot twists and is interesting. I would rate this book nine out of ten stars. 1. Why does Puck ride in the races? 2. Why does Peg put Sean’s name at the top of the list? 3. Why is Mutt not allowed to choose his own horse? 4. Who owns Corr, Sean’s horse? 5. Who is Mutt’s horse? 6. Why does Puck want Sean to ride in the capaill uisce (water horse) that Sean offers to Puck? 7. Why does Puck go the parade? 8. Where is Gabe when Puck finds him? 9. When Eaton rejects Puck from riding in the races, what does Sean say to make Eaton give in? 10. Why does Sean quit working for Malvern? 11. What does Mutt do to Edana? 12. Why does Puck dream up stories of winning the races? 13. How many times has Sean lost to Ian Privett? 14. Why does Mutt want Skata? 15. How does Sean get Corr?